This revolutionary training app allows you to personalise your training programme based on a simple one minute measurement. Read on for all you need to know about getting started with ithlete and heart rate variability. Before you get started please make sure you have the required hardware and have downloaded the app. When should I use ithlete? Take your ithlete HRV measurement each morning upon waking. Why? We recommend taking your daily ithlete measurement first thing in the morning to avoid the influence of variable external factors such as life stress, work stress, caffeine etc. Additionally measuring your HRV first thing in the morning is practical; you can make your training plans based on your body’s readiness to train after a full night of recovery! Where should I use ithlete? 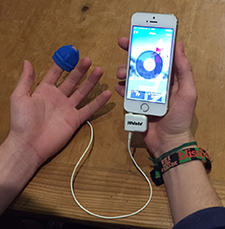 The ithlete Finger Sensor should always be used whilst sitting. Why? Research has shown this to provide the strongest correlation to gold standard ECG measurement. Using a HRM chest strap most users can take their ithlete measurement sitting down. Why? HRV research studies have found that HRV is distorted when lying down in people with very low resting heart rates (50 and under). Standing (or even sitting) will raise this by a few bpm because your heart has to work a little more to pump blood uphill. Therefore only very fit users should ideally measure standing. The most important thing to remember is to be consistent. Click for more information, or why not check out our Frequently Asked Questions. Plug in to the headset socket of your compatible phone or tablet. If using ithlete for the first time you will need to select the Finger Sensor option from the ithlete app Settings ⇒ Choose sensor and follow the instructions page. We recommend watching this short video to enhance sensor performance. Ensure your HRM chest strap is compatible and plug the ithlete ECG receiver into the headset socket of your device. Check it is firmly in place (you will hear a click) with the logo facing forwards. Select the ‘ECG receiver’ option from the app Settings ⇒ Choose sensor. Put on your Bluetooth Smart HRM chest strap (ensuring the skin contact patches are moistened), open the ithlete app, go to Settings ⇒ Choose sensor and follow the on-screen instructions to connect. 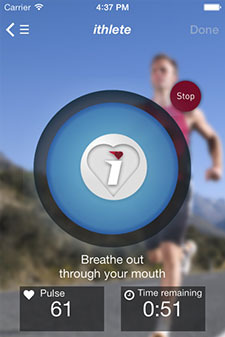 The sensor is connecting to the app and waiting for your heartbeat to stabilize before you can begin measurement. Once the button goes green press to start. The heart speeds up when you inhale. The gap between heartbeats (HRV) is therefore affected by your breathing. 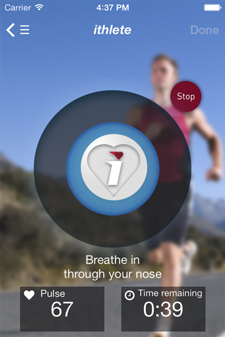 We ask users to follow the paced breathing exercise to ensure consistency of measurement. Upon completing your ithlete HRV measurement you are presented with the option to record 6 lifestyle factors; sleep, fatigue, muscle, stress, mood and diet. Use the sliding scales to record as you wish. We recommend tracking these areas to enable easier identification of trends and patterns in relation to your HRV scores. You can also record training load and any comments. This is your HRV score and is conveniently colour coded to give you the day’s training recommendation. 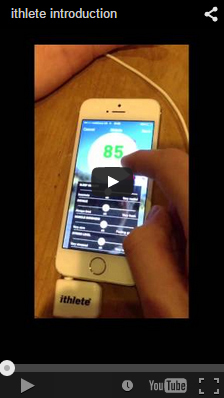 Your ithlete score is based on a standard HRV measurement that we have scaled to make intuitive for our users. Every individual is different and so the most important figure to look for is the change from your personal baseline. An upward trend over time indicates increasing fitness and is more important than the absolute scores. 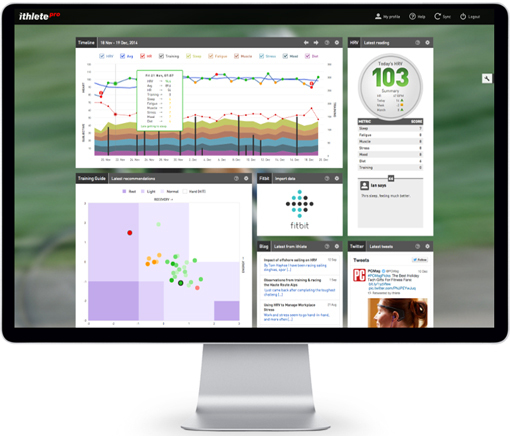 Use the Dashboard to view your HRV scores and baseline over time at a glance. Turn the device landscape to view the detailed chart allowing you to explore the relationship between HRV, training load and subjective feelings (which we recommend you record to help you learn what works for your body!). Tap the charts to change the timescale. Make the most of monitoring HRV by utilising ithlete Pro to analyse data in more detail and receive specific training guidance. Available from any web browser ithlete Pro also stores your data in the cloud keeping it safe and allowing you to monitor across devices.